Happy New Years VT! May you find happiness, security and Benjamins lying on the ground this year. 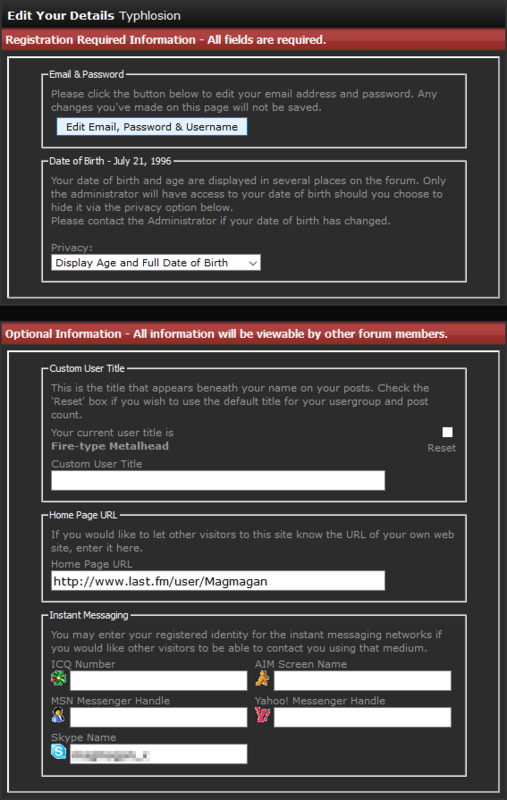 It will show up in the User CP then under "you profile" and "edit your details". It is called a Custom user title. It may take an hour or two.. I remember when i had 2500, I couldn't find it for a while haha. And you could reach that milestone quickly, I think I reached it within four months of joining. I wish it could be done earlier. So many creative titles gone to waste. Funnily enough, moderators cannot change their titles, and can only have a different title if they had it changed before becoming mods. Thank you to everyone who replied! Last edited by Moriya; February 13th, 2016 at 03:24 PM. I'd like to add in one TEENY tiny thing for anyone who might read this and get confused bc "I reached 2500 and I'm looking in the spot Alex said but it's not there!" Sometimes it takes a while for the field to show up. Give it a couple days, it should appear. It will show up no longer than two hours after reaching 2500 posts. This is because the server processes user promotions at a specific time each hour and if you make your 2500th post 1 minute after the process has completed, it won't happen for another hour.